The trade of rare wildlife on the internet increases in 2012. ProFauna Indonesia, a leading organisation working for the protection of wildlife in Indonesia, records show that there have been more than 303 protected wildlife consisting of 27 species being traded on the internet along 2012. The scpecies were: Java mouse-deer (Tragulus javanicus), pangolin (Manis javanica), barking deer (Muntiacus mutjack), leopard cat (Prionailurus bengalensis), Javan langur (Trachypithecus auratus), slow loris (Nycticebus sp. ), Javan Hawk-eagle (Nisaetus bartelsi), black eagle (Ictinaetus malayensis), palm Cockatoo (Probosciger atterimus), and Salmon-crested Cockatoo (Cacatua molucensis). 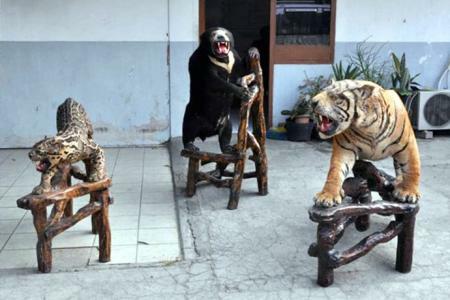 The wildlife protected by law were traded in some online shopping websites like Toko Bagus, Kaskus, and Berniaga. Traders also advertised the illegal wildlife through their social networks like Facebook. Rosek Nursahid, Chairman of ProFauna Indonesia stated, "Now, it is more difficult to curb the trade of rare wildlife in Indonesia because it takes place on the internet and buyers do not have to meet the traders in person for the transaction". Nursahid added, "Owners of the online shopping websites and the authorized government should block the advertisement offering protected wildlife". In 2012, there were more than five cases of wildlife trade on the internet going through judicial processes. The records show that some of the locations for the trade were in Jakarta, Kerawang - West Java, and Pemanukan - West Java. From four suspects, the government confiscated dozens wildlife like the Javan Hawk-eagle, Changeable Hawk-eagle, tiger skin, stuffed sea turtle, crocodile, slow loris, leopard cat, and palm cockatoo. Despite the increasing wildlife trade on the internet, there is a good news. One of the shopping websites, Toko Bagus, made an agreement with ProFauna Indonesia not to advertise protected wildlife offers. The initiative is very positive and should play a role model for other shopping websites. Besides taking place on the internet, the trade of protected wildlife in some bird (animal/pet) markets in Java and Bali remains high. In 2012, ProFauna Indonesia records show that the average trade of the protected wildlife in the markets is 91 individuals per month. The protected wildlife being traded consist of 21 species:Javan langur (Trachypithecus auratus), slow loris (Nycticebus sp. ), black-capped lory (Lorius lory), eclectus parrot (Eclectus roratus), Sulphur-crested Cockatoo (Cacatua galerita), Goffin Cockatoo (Cacatua goffini), Black-winged starling (Sturnus melanopterus), flame-fronted barbet (Megalaima armilaris), White-bellied Sea-eagle (Haliaeetus leucogaster), Bali myna (Leucopsar rothschildi), black eagle (Ictinaetus malayensis), green turtle (Chelonia mydas), banded pitta (Pitta guajana), collared kingfisher (Todirhamphus chloris), leopard cat (Prionailurus bengalensis), spotted kestrel (Falco moluccensis), crested serpent eagle (Spilornis cheela), hawks and eagles (Accipitridae), black-winged kite (Elanus caeruleus), otter civet (Cynogale bennettii), and porcupine (Hystrix sp.). Some bird markets remained selling protected wildlife included: Malang bird market selling 4 protected individuals (5%), Satria bird market selling 5 protected individuals (6%), Bratang bird market selling 6 protected individuals (7%), Kupang bird market selling 9 protected individuals (10%), Pramuka bird market selling 28 protected individuals (33%), Jatinegara bird market selling 25 protected individuals (29%) , and Barito bird market selling 9 protected individuals (10%). The trade of protected wildlife both alive species and the body parts is illegal. According to the Law number 5 year 1990 concerning the Conservation of the Natural Resources and the Ecosystem, offenders (both traders and buyers) are liable to a maximum five year prison term and a 100 million Indonesia Rupiah fine. ProFauna Indonesia urges the government to enforce the law to curb the trade. ProFauna also encouraged the public to help stopping the trade by not buying protected wildlife.